With Two Factor Authentication (also known as Two Step Verification) you can protect your CDNsun account with both your password and your phone. For example let's assume that you are using the same password to access your CDNsun account and your account on some other website (please don't do it, always use unique passwords). If someone will hack the other website and will obtain your password he will gain access to your CDNsun account. But not if your CDNsun account will have 2FA enabled, the hacker will not be able to log in to your CDNsun account even if he will have your password. An iOS or Android smart-phone with the Google Authenticator app installed. For iOS the app is available via Apple's App Store and for Android the app is available via Google Play. Fill in your phone number on the Billing/Settings page. It will be used as a backup if you will lost access to your Google Authenticator app (e.g. you accidentally delete it). 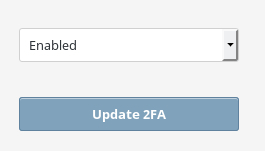 On the Billing/Settings page enable 2FA as in the picture below. You will be redirected to a page with a QR code (two-dimensional barcode) image. 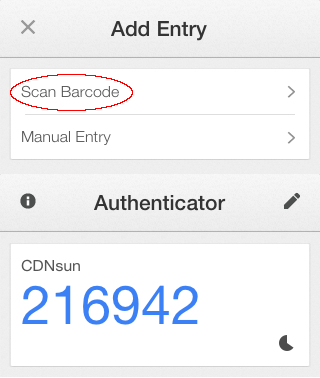 Use the QR code to add CDNsun to your Google Authenticator app as in the picture below. 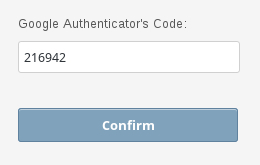 Confirm the addition using the Google Authenticator's time-based code as in the picture below. That's all. From now on you will be asked for Google Authenticator's time-based code when you will be logging in to your CDNsun account.